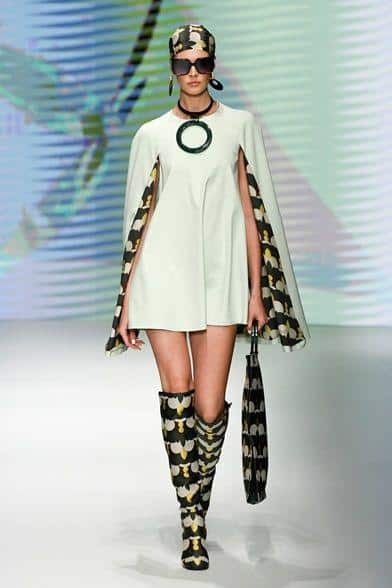 Cape Clothes 2019: trendy news | KSISTYLE! A cape is a sleeveless outer garment, which covers the back, arms and sometimes chest. We have already told you about all the features of cape for confident and elegant women. If you missed the post — read it again. Cape has no sleeves. But the wide slits for the hands make it quite practical in everyday life. On a cool evening, you can completely hide your hands under a spacious cloth. 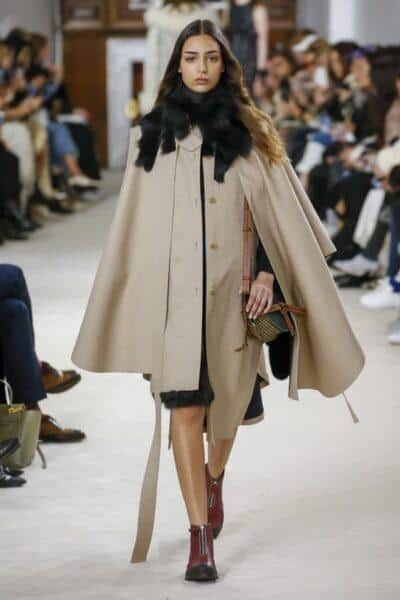 We present you a full review of the capes styles from fashion shows of famous designers in 2019. What are the main features of fashionable cape novelties? — Capes have different lengths. You can find both long cape dresses and short capes coats which perfectly suit for modern outfit. — Fabric of different thickness and texture is used: thin transparent tulle for dresses, dense materials — for winter coats. — using 2019 fashion prints: leopard, tartan, strip. 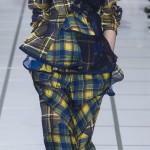 Moreover, fashionable images can be created based on a combination of different prints. - In addition to the restrained intelligent colors that we are used to see, there are bright colored capes of «festival» themes, as well as a fashionable shiny golden and silver metallic. Let’s look in detail all the most popular styles, presented in 2019. The most common type of clothing is one from which the history of the capes began. Young girls will choose short models which expose slender legs. Short dresses and pencil skirts suit for them perfectly. Older women wear a spacious knee-length cape. You can wear them not only with dresses, but with tight-fitting trousers. Elegant high-heeled shoes or spectacular jackboots add this fashion outfit. Talented Gucci offers us a fur cape variation. Modern ladies will not miss the opportunity to warm themselves in cold in a warm fur coat. As you can see, the fur cape in the photo has a «winter» midi length, an impressive pastel shade. The basis of the next image is a gray cape. The calm color of the outerwear is complemented by catchy accents — a scarf with a print, as well as sandals wearing socks. Other fashionable images of 2019, see the recent publication of our authors. A cape dress is an exquisite dress with a cape, which is cut together with the main part of the clothes. The cape is made from the same material, most often it has the same length. What cape dress are fashion in 2019? This modern version of the cap carries notes of seductiveness and severity at the same time. Clear laconic lines and thick fabric are characteristic of classic dresses. Frank mini and long bare legs — one of the main «magnets» in the female appearance, which attract men. Look at the accessories in the next outfit.There are round earrings and a massive pendant choker. If you want to learn about fashionable chokers in 2019 and consider the most relevant options, then read the publication on the site. Amazing evening dresses are sewn from fine expensive fabrics. A long cape dress beautifully emphasizes the waist and hips. Cape covers shoulders, but does not hide the charm of the female body. When walking, a thin flying cape flutters, creating an incredible lightness effect. As you noticed, a long wedding dress-cape turns a girl into a princess. The royal train of the Victorian era makes the girl’s shoulders more graceful, hides the fullness of the hands, tightens the silhouette. Experts recommend wear wedding cape dress with a wreath of flowers or a tiara, but not a veil. The most progressive women changed their dress to evening overalls. This outfit will fit not only for a birthday dinner, but also for a prom, and even a wedding. Therefore, the designer’s experiments with overalls capes are quite predictable. Festive styles are presented most often in bright or light colors. A jacket is a basic thing for many women. Of course, every woman wants to choose her style so as to be different from others. 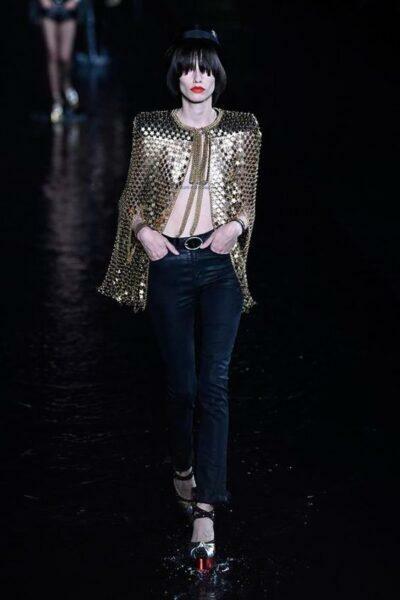 Perhaps a Cape jacket is your choice? The cape is tightly connected to the jacket and has the same length. Cardigan has no zippers, wear unbuttoned. It can be wear with a plain T-shirt, blouse or shirt. The stores feature more dark or white practical capes that fit almost any item from your wardrobe. You have seen that fashion approves 2019 (and even recommended) cape? Do not forget to tell about it to your friends in social networks.